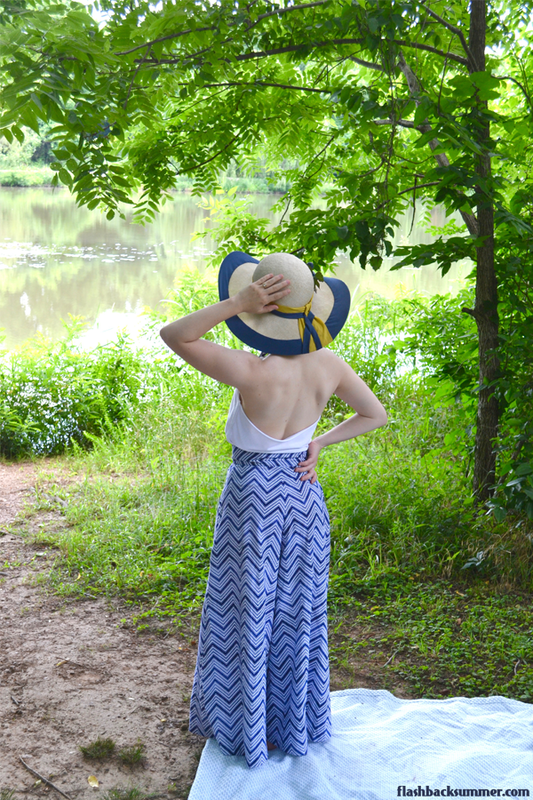 When I saw the pattern, I couldn't help but think of 1930s palazzo pant styles with giant sun hats and loose tank tops perfect for the beach. Living in a land-locked state in the middle of the U.S., I obviously decided that that is exactly what I need... beach pajamas! While they don't get used at actual beaches.... we have a lot of lakes and rivers around here that they still work quite well for. The pants pattern comes with three waistband versions in different button and zipper combos to suit your preference. I picked the view with just a zipper going all the way up the extra-high waistband. I didn't make any changes to the pattern except to shorten it 3-4" for my petite self, an adjustment I usually have to do with trousers. These were great to put together because there are only three pattern pieces, and I got them done in about a day. No darts, lots of straight seams... It's fantastic! This pattern would be especially awesome if you're a beginner sewist or newer to apparel sewing. The instructions are really thorough and have very clear illustrations for each step. It would be a lot more helpful to beginners than any patterns from the Big 5 or even most indie designers, and I highly recommend it. I made mine up in a chevron print quilting cotton. Sure, they wrinkle a bit when worn, but nothing beats breezy cotton on a hot day. It breathes, it's comfy, and it will drape even more beautifully as it is washed and softens up. And I managed to get the print mirrored at every seam!!! I'm actually pretty proud of that, I won't lie. The trousers are fantastic, but they really needed a top to coordinate. I wanted it to be a really quick, easy top to merit the times I'll wear it outside. I wanted it to be simple and not a lot of work so if I sweat or play outside in it... I won't feel like I need to coddle it or be careful. Basically... I needed the 1930s version of a cutoff t-shirt. I got a t-shirt that my husband has had that is too big for him, and I cut it up into a rectangle for the back and a shape for the front that looked like a triangle on top of a rectangle. I folded the top point down and sewed it to make a tube, then I threaded a ribbon made of the trouser fabric through it, and... bam! Matching top! Done and done. I highly recommend this Linden Lady Palazzo Pants pattern to you guys. 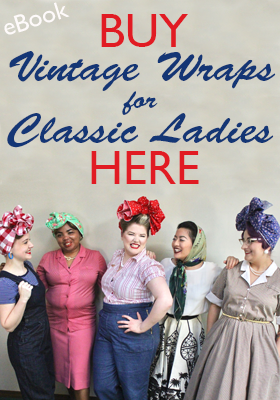 It's quite affordable, and it's great to support a budding female entrepreneur from our own vintage community. I am definitely going to be making this pattern up again! 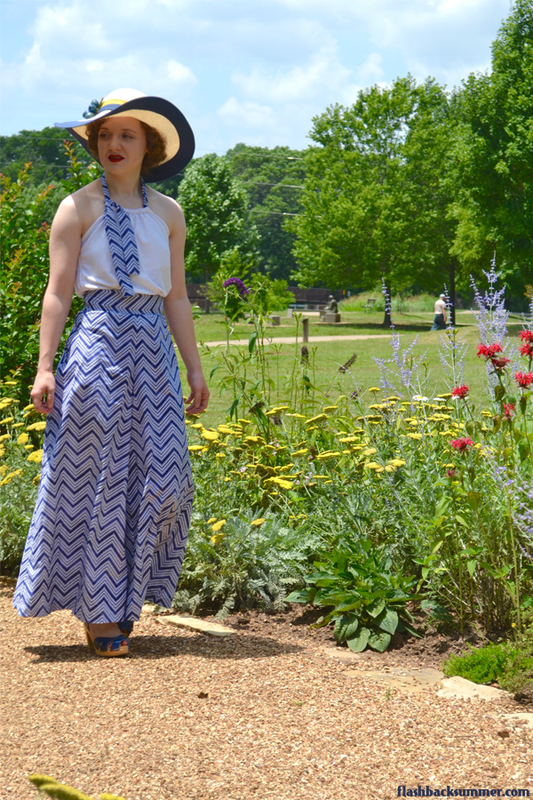 Pattern: Brijee "Linden Lady Palazzo Pants"
How historically accurate is it? Cotton and metal zipper are accurate, the fusible interfacing no one can see is not... but no one can see it, so I'm going to say it's pretty 1930s. Any tricky parts to the pattern? Just be sure to mark front and back pattern pieces. The leg pieces are huge, so it's a good thing to keep it all organized. Also, the waistband is wider at the top than the bottom, so be sure not to flip it! Did you change anything? I shortened it by 3-4". Total cost: The pattern originally cost me $8 for the single size, and the multi-size was given to me by Brigid for review. The fabric was about $20 for 4 yards. The zipper is from my stash. Notes: I've gone into great detail above! 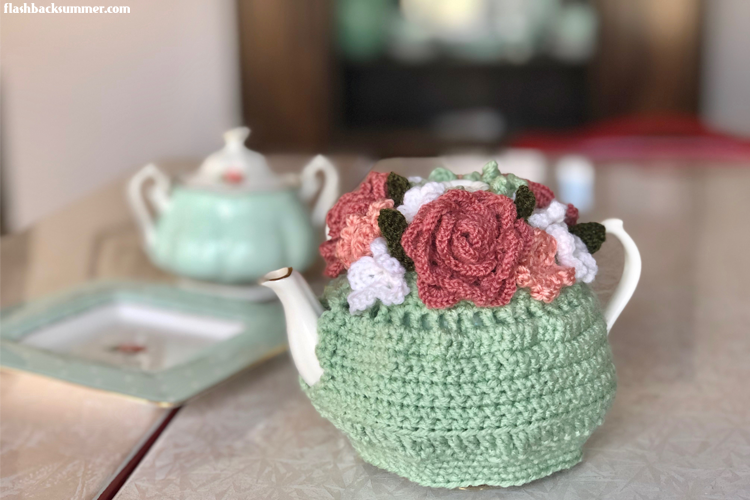 I love this pattern and highly recommend it! How would you style palazzo pants? What fabrics would you pair with this pattern for your own wardrobe? Those are AMAZING! 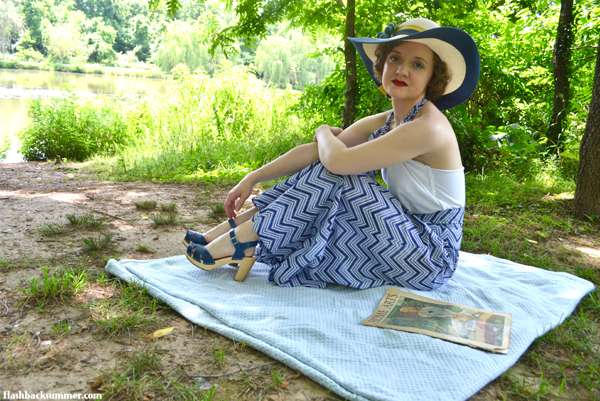 I have some linen/rayon lounge pants from a modified 1930s pattern that I wear all of the time. With a camisole or tank and bold jewelry they're the most stylish, comfy, secret pajama outfits I have. Thank you, Evie! That is a brilliant outfit formula, in my opinion. It DOES sound stylish and comfy!! Haha, thank you so much! I hope I'll get around to making another pair soon. I love the fabric you chose for these and that too you made to go with them is perfect!! Thank you very much, Madison! Glad you like it! These types of pants are my new favourite thing. So chic looking, so cool, and so comfortable. They even look super flow-y in a quilting cotton! Great to find a new pattern for them! I LOVE these! I am all about big, loose, flowy kinds of clothes! I am COMPLETELY IMPRESSED that you got the chevron lined up at the seams...I would NEVER be so bold as to pick such a pattern. Also, your "done and done" top? I LOVE it but...I'm afraid I would need a little more help/time to get it together. Def not a one day project for ME, but that's why YOU are he bomb and vintage seamstress extraordinnaire! LOVE the look on you! How amazing! 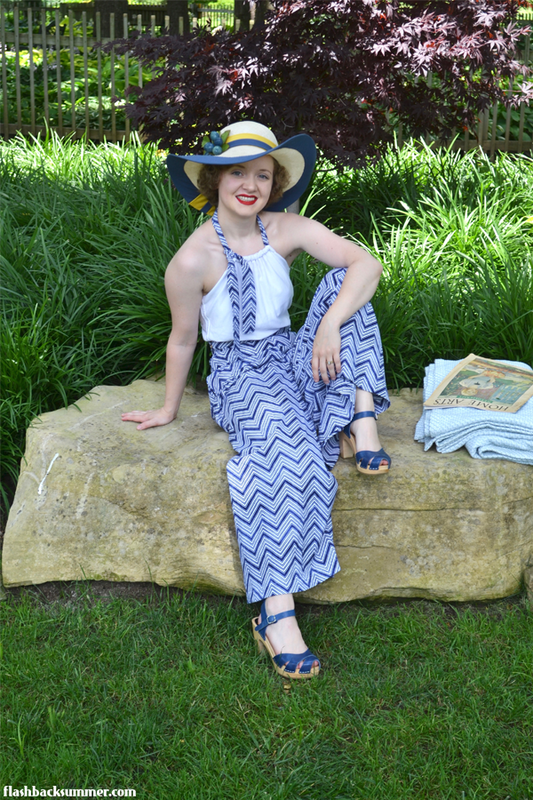 I love palazzo pants andyou chose a wonderful fabric with chevron pattern. I am planning on expanding my collection of palazzo trousers and sew some for me and maybe also sell some pieces. The whole outfit is really lovely! I absolutely adore this and you have encouraged me to try and make a pair. I'm not sure how they will look on a plus-sized gal like myself, but I will try it and see. Thank you so much! Oh good! I think they'll look fantastic. If you do end up making them, I'd love to see them! Ooooh, that would be fantastic! This whole outfit is incredible! So chic and sophisticated whilst remaining relaxed and casual. I totally want to go for a picnic by a lake now !!! It would be perfect for you! If you do indeed try it, I'd love to see it! Emileigh, I cannot thank you enough for your wonderful review of the Linden Lady! They turned out beautifully, and I SO appreciate your critiques regarding the pattern. LOVE! 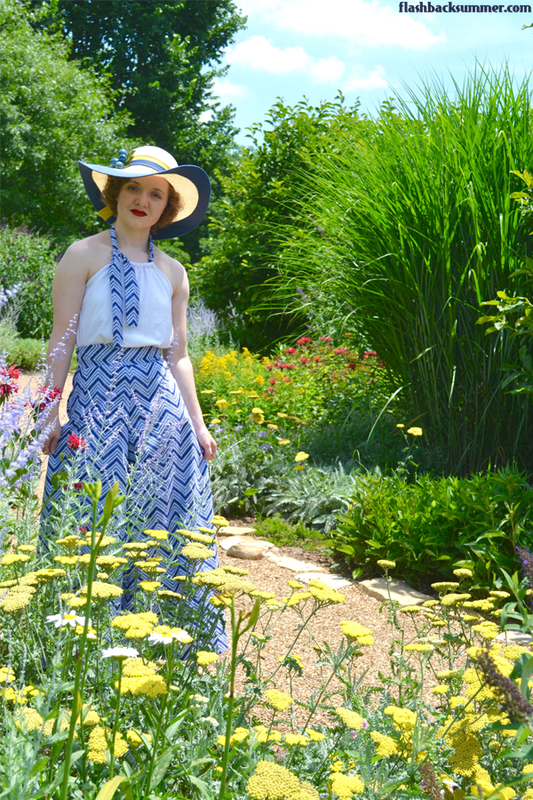 Love love love :D Everything from the stellar review, to the fantastic trousers, Swedish Hasbeens and darling sunhat. Perfection. I have this pattern but I haven't made it yet. 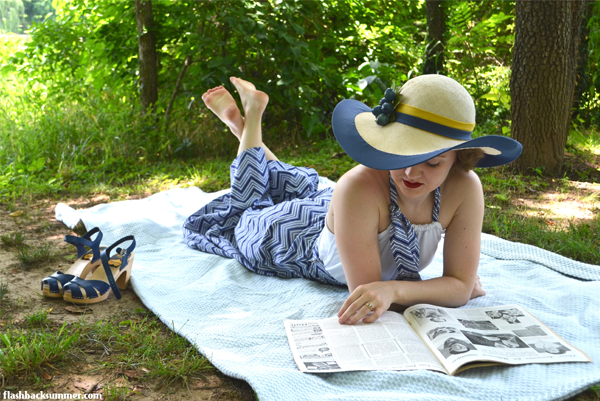 I'm so glad of your review and all the photos, though I'm wondering if maybe I chose the wrong fabric (linen) because your chevron stripes are SO vintagey wonderful! Psh, linen will still be great! I'm thinking of making a gray linen version for myself! Wow! You look super! Absolutely beautiful! You have made such a fabulous outfit! The trousers are fantastic and I love the clever matching top you made too. Okay, honestly, my jaw dropped when I looking at these photos! You did a marvelous job! 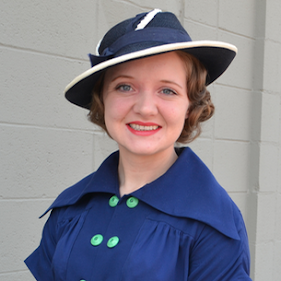 You look like you came right out of a 30s photograph! The top is perfect too! I need to get back to sewing! Especially because I want more pants like these. I recently bought two riding skirts, which are pretty much these, which have been holding me over lately, but of course I want brighter colors! Well thank you very much, Janey! I highly recommend this pattern for you, especially since it's been a bit since you've sewn. The directions are really easy to understand, and there are even fitting tips and stuff. Love love love! Well done. Magnificent summer outfit! I feel like you should be on the cover of a 1930s edition of Vogue and/or lounging on a beach at the French Riviera, because it really doesn't get more timelessly chic than this!